Small-scale developer Prowind has ordered three 4.8MW versions of the turbine, which is also available with a power rating of 5.3MW. It is the first order for the platform since it was unveiled in September 2017 and comes as WindEurope's conference and exhibition 2019 kicks off in Bilbao, Spain. The turbines will be installed at the Elfershausen project in Bavaria, southern Germany with a hub height between 150 and 161 metres, GE said. The 77-metre two-piece blades will form a 158-metre rotor diameter. GE will also service the site for 20 years. "The Cypress platform is a great fit for the unique characteristics of the Elfershausen project, thanks to the flexibility it offers in the transportation and the installation of its components and blades," said Prowind CEO and founder, Johannes Busmann. 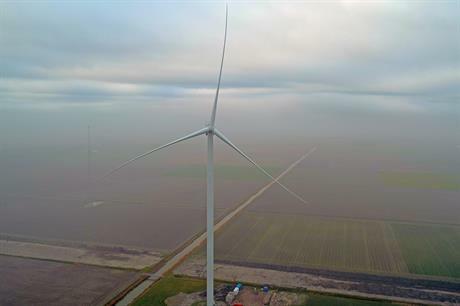 In February, GE installed a prototype of the Cypress turbine at 5.3MW of nameplate capacity at a test site in the Netherlands. Then, Sheri Hickok, GE's general manager of global product development, announced a customer for the turbine platform would soon be announced.